That’s Bulls Head Coach Lance Leipold making sure everyone knows that there is still a game to be won. Friday, the Bulls will play for their second MAC Championship. This amazing, 10-win season feels like it’s been headed to this moment since it started. Now, the Bulls have a chance to cap it off with their ultimate prize, raising the trophy. Northern Illinois knows how to do that, having won three titles with the last in 2014. They have been the class of the MAC, and it’s fitting that a UB team that wants to become a perennial winner has the chance to start that against the Huskies. This matchup features the top two defenses in the conference. It will pit the Offensive Player of the Year (Tyree Jackson) against the Defensive Player of the Year (Sutton Smith). It’s the Coach of the Year (Leipold) against one of the MAC’s winningest coaches (Rod Carey). It’s everything that you want in a championship game. It’s everything the Bulls have been working for since the summer. It’s a chance to make the coach’s words from the offseason ring true. Bull Session Trivia: The game will be played at Detroit’s Ford Field. When is the last time the Bulls played a game in a dome stadium? Bonus question: Why are the Bulls (the designated home team) not the only Buffalo team to play a home game at Ford Field? The incredibly balanced Buffalo offense was on display in the final regular season MAC statistics. The offense ranked 3rd overall, 4th in rushing and 6th in passing. Their average of 35.2 points per game was third…The Bulls first score against NIU will set a new season record for points, breaking the previous mark set in 2008. The Bulls have already set a record for total TD’s and rushing TD’s…Tyree’s 47 yard pass to Charlie Jones against Bowling Green made it 10 straight games with a play of at least 44 yards. Jaret Patterson’s 40-yard TD run was the Bulls 14th 30-yard score of the year…Getting off to a good start will be key. 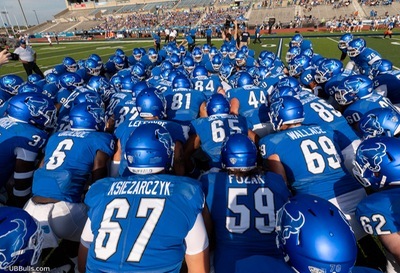 UB has a touchdown on their first or second drive in eight of twelve games this season. They outscore opponents 130-58 in the opening 15 minutes…Jackson comes in as the MAC’s #2 passer, and #2 in TD passes…This will be T3’s 30th career start, with a record of 17-12. Remember, he started his career 2-7… A stat that reflects his long ball, big play style is yards per completion. Tyree’s 13.9 average ranks 12th in the NCAA…Tyree is one of two Bulls to have played in Ford Field. He led Mona Shores (MI) High School to the Michigan Division II finals in 2014, exactly 4 years and 2 days ago. He had been injured the week before, and his team lost the game. “I try not to remember the score, but it was a good experience and I always wanted to get back there and get another shot at it.” Long snapper Jeremiah Riordan also played at Ford Field with his Detroit Jesuit High School team…Jaret Patterson is 44 yards away from UB’s freshman rushing record, and 126 yards away from the 10th 1000-yard season in UB history…Despite missing most of three games, Anthony Johnson still has 820 yards receiving and nine touchdowns. Last season against NIU, AJ had 7 catches for 140 yards…Good for tight end Tyler Mabry on being named 1st Team All-MAC. He led all conference tight ends in catches, but was equally deserving for his blocking…Center James O’Hagan will make his 49th straight start…The offensive line will face its biggest test in the Huskies defense. Their strength is the front seven, especially the defensive line. NIU has not allowed a 100-yard rusher all season. They have held seven of their twelve opponents to under 100 yards rushing…With Sutton Smith leading the way, the Huskies lead the nation with 46 sacks. Smith has 13. Fellow defensive end Josh Corcoran has eight. Defensive tackle Jack Heflin has six…A big break for UB regards Corcoran. He’ll miss the first half following a targeting call in their last game against Western Michigan…Linebacker Antonio Jones-Davis is 1st team All-MAC, and led the team with 104 tackles…The NIU pass defense ranked only 9th in the MAC. They have had to replace some key injured players in the secondary. Safety Trayshon Foster has been out the last two games with a knee injury. He is expected to start. The team lost starting cornerback Albert Smalls after the third game. So Jalen Embry has become the top cover man. “They have an athletic group of secondary players who play with a lot of confidence because they know there’s a good chance the quarterback has someone putting on pressure,” says Leipold. Bullet Points: 10. That’s how many Bulls received All-MAC honors. It’s a school record. Six (Jackson, Johnson, O’Hagan, Mabry, Khalil Hodge, Chuck Harris) made the first team. Jackson is the first ever Bulls quarterback to be named to any of the All-MAC teams. The Bulls finished second in the MAC in total defense. But the margin from top-ranked Northern Illinois was 344.0 yards to 344.4 yards…The Bulls were 5th against the run, 4th vs. the pass. The pass defense number of 174.9 ranked 12th in the NCAA…The defense allowed the fewest first downs in the MAC, and had at least one sack in every game…Hodge’s regular season total of 130 tackles ranked him 3rd in the MAC, 16th in the NCAA. He moved up to 3rd on UB’s all-time list with 406 career stops…It was Hodge that forced the fumble that Brandon Williams took 69 yards against Bowling Green for the Bulls first defensive touchdown of the season…Despite not earning an All-MAC honor, I feel like DT Justin Brandon has been the unsung hero of the defense. He’s allowed Hodge to make tackles and the rushers to get to the quarterback by tying up blockers…Freshman Eddie Wilson made his first start at defensive tackle against BG. He’s the 4th different player to start next to Brandon at the defensive tackle spot, an example of the Bulls depth and competition…Northern Illinois’ offense has struggle for most of the season. They only scored 30 points twice. Luckily, they have a defense that holds teams down in points, which is why the Huskies are in Detroit. NIU is 11th in points, 10th in yards, and 11th in passing. They are 5th in rushing, led by Tre Harbison. He’s the MAC’s 3rd leading rusher with 950 yards…QB Marcus Childers made his first career start against UB last season. He took some steps back this year. His 8.9 yards per completion was the second-worst figure in the country. He failed to top 200 yards passing in 11 of his 12 starts. But Childers is a strong runner, who nearly ran for 500 yards on the season. He is a very good ball handler in a Huskies offense that features a lot of motion, deception, jet sweeps and read option runs…Juan Wesley is the only Huskie wideout to average over 10 yards per catch. Leading catcher D.J. Brown had 51 grabs, but averaged only 7.8 yards per catch…The Huskies have used seven different offensive line combinations. But they have one of the best pro prospects in the MAC in left tackle Max Sharping. “He’s a special defensive end with a special skill set.” That’s Leipold’s description of Sutton Smith, maybe the most dominating player in the MAC. The stats are off the chart. 13 sacks to lead the MAC. 21 tackles for loss to lead the MAC. 4 forced fumbles to lead the MAC. 3 fumble recoveries to lead the MAC. He’s scored one touchdown on a fumble return, one on a blocked punt. He’s got four career TDs. He is a game wrecker, and it’s up to the Bulls offensive line to make sure he doesn’t wreck this game. “He’s got incredible speed. He’s awesome off the edge. He does an incredible job with his hands, getting off blocks,” says O’Hagan of the MAC Defensive Player of the Year. Smith is undersized for a classic defensive end, at six-foot-one and 237 pounds. That confuses long, tall offensive tackles who are used to blocking bigger players. Smith uses his speed advantage to go around them, instead of through them. That will be the challenge for Bulls tackles Evan Ksiezarczyk & Kayode Awosika. Look for the Bulls to use guards, tight ends and running backs to help out on the blocking of Smith. If you remember, it was Smith who sacked QB Drew Anderson last year, and knocked him out for the season and effecting that 2017 run to a bowl game. Bull Session Trivia Answer: The International Bowl at Toronto’s Rogers Centre in January of 2009 was the last time the Bulls played in a dome. Bonus answer: The Buffalo Bills played a “home” game at Ford Field in 2014 when their game against the Jets was moved due to seven feet of snow in Orchard Park. Please join me, color analyst Scott Wilson, game host Brad Riter and postgame host Bob Gaughan for the broadcast on the Bulls Football Network. Our pregame show starts at 6:00pm. You can hear it in Buffalo on ESPN 1520 and in Rochester on Fox Sports 1280. A link to the online broadcast is also available here and on the Tune In app.